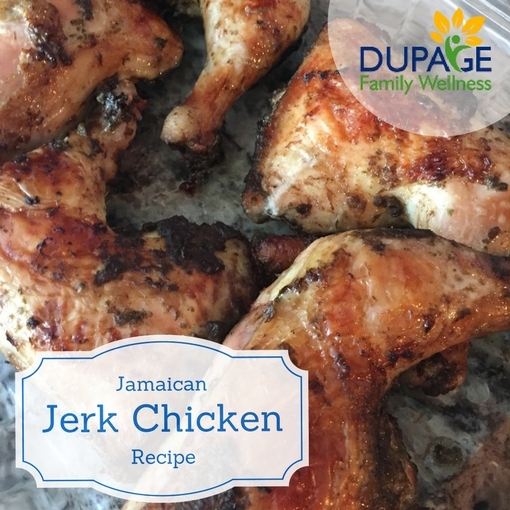 Earlier this week, we tried a new recipe for Jamaican Jerk Chicken, and it was so good that I had to share it with you. My husband Jared based what he did off of this recipe from foodandwine.com. I’ll list what he did here since he made several tweaks to the recipe. The original recipe has almost 4000-5 star ratings, so we aren’t the only one who thought it was delicious! In a food processor, combine the onion, scallions, jalapenos, garlic, five-spice powder, pepper, thyme, nutmeg and salt. Process it into a paste. With the machine on, add the Coconut aminos and olive oil in a steady stream. Pour the marinade into a large, shallow dish, add the chicken and turn to coat. Cover and refrigerate overnight. In a cast-iron skillet, sear both sides of each piece of chicken. I did about 4 minutes per side on high. Transfer to pan and cook the chicken quarters for 35-40 minutes. Be sure that internal temperature reaches at least 165 degrees. The original recipe called for 35-40 minutes on the grill. I’m sure my husband would have done this, but I got home earlier the night we made these. I am more comfortable with stove and oven cooking than grilling. I’m sure they’d be delicious either way. If you try this out, let me know what you think on our facebook page. Enjoy.